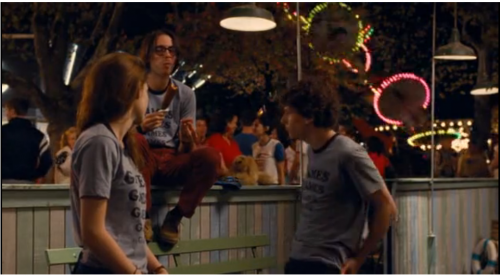 This week’s installment is the 2009 comedy Adventureland, starring the likes of Jesse Eisenberg, Kristen Stewart, Ryan Reynolds, Bill Hader, and Kristen Wiig, among others. 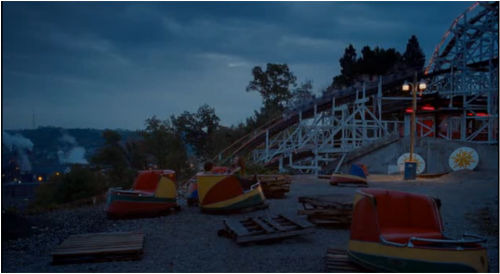 It was filmed on location at Kennywood park and some other local areas that we’ll get to later. 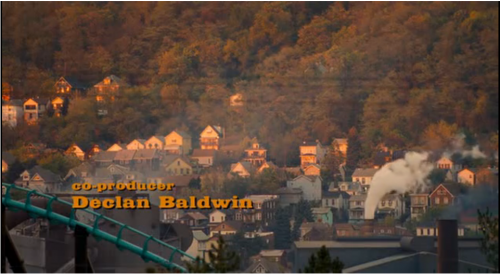 Set in 1987, it’s about a recent college graduate who ends up living at home for the summer in Pittsburgh and working a job at the local theme park “Adventureland” (Kennywood). It’s a little dated, but seeing as it’s early into Summer, I thought it would be an appropriate start with all of the Kennywood picnic outings and memorable (for better or worse) summer jobs in full swing. Plus, it seems like plenty of people still make the connection between Kennywood and the film. Though I wouldn’t recommend it for everyone (it garnered an R rating “for language, drug use, and sexual references”), I thought it was a charming, funny, coming-of-age/finding-your-place film. 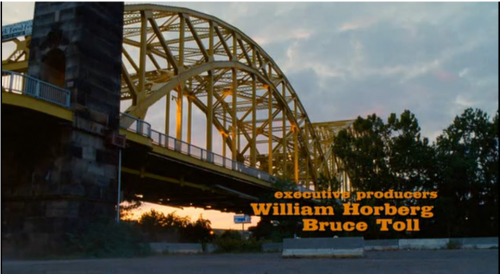 It’s well-casted and there are Pittsburgh references and familiar sites all throughout the film. However, within moments of the start when Eisenberg’s character learns that he has to live at home during the summer, one of his snobby, yuppie friends comments “Summer in Pittsburgh, that’s [expletive] harsh.” To which Eisenberg responds, “They don’t like people like us where I’m from, we’re romantics.” Speak for yourself, pal! Another unbelievable part occurs when Eisenberg’s character scoffs at the idea of taking journalism courses at Pitt with the possibility of interning on “Mister Roger’s Neighborhood,” calling it a “children’s show with marionettes.” Now what Pittsburgher in their right mind would ever have anything negative to say about Fred Rogers? Grudges aside, there are some other nice local references. For instance, one character tries to get Lisa P. (the “popular” 80’s chick working the Music Express) to go to a Judas Priest concert at the Civic Arena. Although I’ve found no evidence that Judas Priest actually ever played the Civic Arena, the small detail was a nice touch. The rest of the soundtrack is pretty awesome as well, especially if you like Lou Reed. Eisenberg makes K-Stew cassette mix tapes with Lou Reed songs and talks about how he’s his personal hero, while Ryan Reynolds claims to have jammed with Lou Reed to the awe of all his coworkers (even though he consistently mispronounces “Satellite of Love” at one point). Seriously, Lou Reed is all over this movie (I ain’t mad). Note: there are some nice shots of local sites in the video as well. Move K-Stew, there’s a vintage Yinzer behind you! 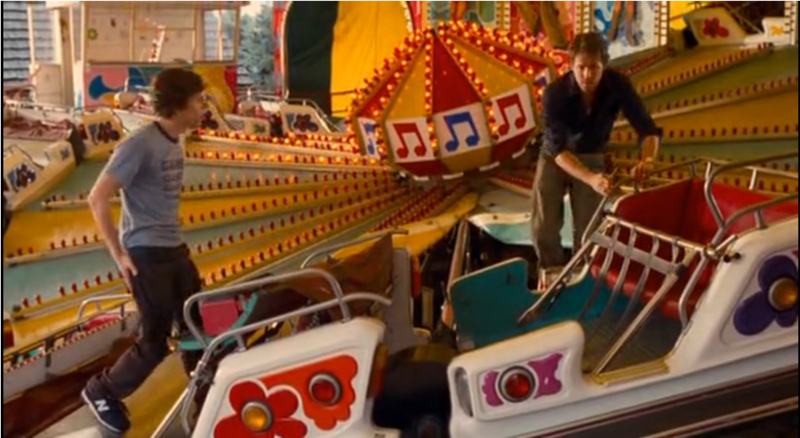 Check out Eisenberg and Reynolds hanging out by the shooting gallery, which I’m unsure is even still in existence. Ah, Eisenberg and Reynolds are at it again (best friends forever)! This time at the Music Express. 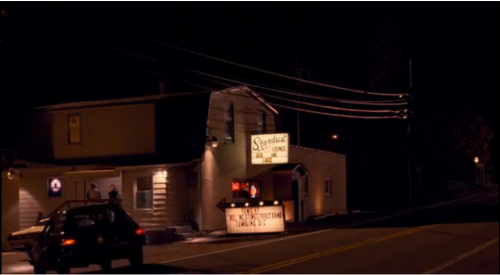 You may recognize many of the sites in just the opening credits as well, like the 16th Street Bridge (which gets a lot of action throughout the film), hills lined with houses in Homestead, and the Stardust Lounge in Moon Township (it’s a real bar). So there are some of the spots featured in Adventureland. Trust me, there are plenty more, and if you haven’t seen the movie, check it out (if you’re over the age of 17 and are not offended by “language, drug use, and sexual references” of course). 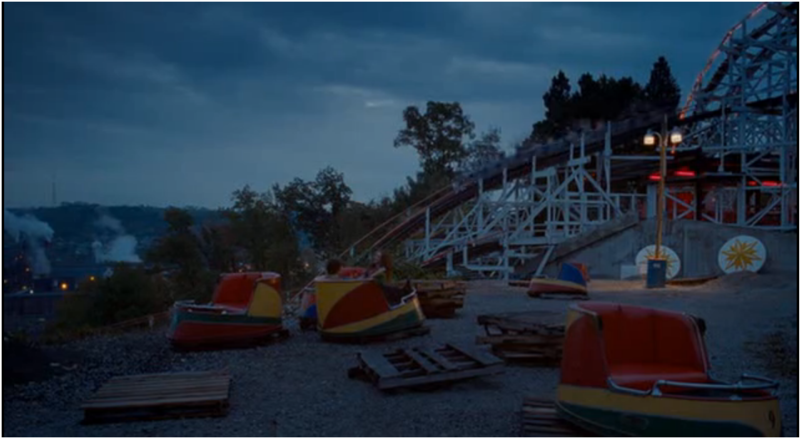 Then you can go to Kennywood and (gasp) stand in the same spot as K-Stew or Ryan Reynolds, or just enjoy the familiar sites of summertime in Pittsburgh. Ok, something’s definitely up here. Everyone knows it’s utterly impossible to have any control over the bumper cars at Kennywood (maybe all bumper cars for that matter), and to successfully enjoy them without waking up to a stiff neck since no one bothers to wear the nasty, dirty, sweatband-like material seat belts of the bumper cars and absolutley NOBODY avoids head-on collisions. But that’s why we love you Kennywood.